''I want to breathe", almost half of the region’s residents are against the project, and fear the environmental impacts. Photo: Vk.comDespite the open protests by ecologists and locals, it seems the Tomino copper mining complex is going ahead. This month, Russia’s largest extractor of copper ore received permission to build in the Chelyabinsk region, in the southern Urals. The project’s designers believe that this mining and refinement plant will bring billions of roubles to the regional budget through taxes, create new jobs and raise the investment potential of the region as a whole. However, almost half of the region’s residents are against the project, and fear the environmental impacts. The project design proposes a full-cycle complex in Tomino, some 12km south of Chelyabinsk. This will make it the largest such factory in Russia today. As the Russian Copper Company (RMK) reports, there’s enough ore reserves at Tomino to last for roughly 50 years. On a yearly basis, that would translate to roughly 28m tonnes going through the complex. Indeed, RMK is currently preparing a site of more than 3,000 hectares for construction, with more than half a million dollars committed. Currently, this site is occupied by a forest, which previously enjoyed the status of a protected territory, and offered some protection to one of Russia’s most polluted cities. However, in 2013, the regional government removed this protected status, without much in the way of public discussion or the necessary decisions in the regional bureaucracy. 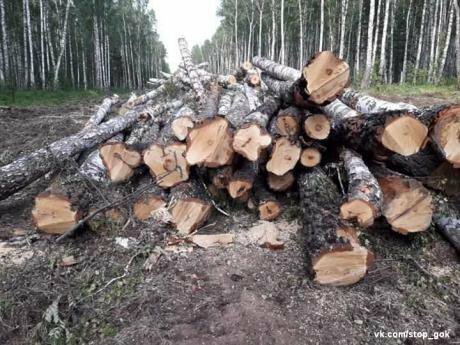 Indeed, it is the felling of this forest and possible pollution of the Shershnev reservoir, the only source of drinking water for the city, which has generated a wave of resentment in the south Urals. Likewise, there are concerns regarding the drilling and blasting method of extraction. Some people believe that this will send tonnes of dust into the air on a daily basis, which will then drift into the city limits. The tree-felling operation at Tomino has already started, despite protests by residents. Source: Stop GOK.These risks have been confirmed by ecological analyses, including those conducted by the Chelyabinsk governor’s office. Off the back of these reports, RMK has been recommended to rework the projects further. Boris Dubrovsky, the regional governor, promised that construction will only begin after everything has been agreed. But the official opening of the Tomino complex took place on 11 July 2017 (albeit, without Dubrovsky in attendance); the forest felling and preparation work had begun a few days before. The governor’s opinion contradicts many of his constituents, who, according to an official poll by the All-Russian Opinion Research Center, are against it in 51% of cases. When municipal deputies conducted their own survey, they found that more than 70% of people living in direct proximity to the site (Tomino and the nearby Korkino district) were against it. Russia’s Presidential Human Rights Council also recently recommended RMK not to start construction without the necessary decisions in place. However, as yet no one has presented new project plans (which are supposed to deal with the risks) to the public. 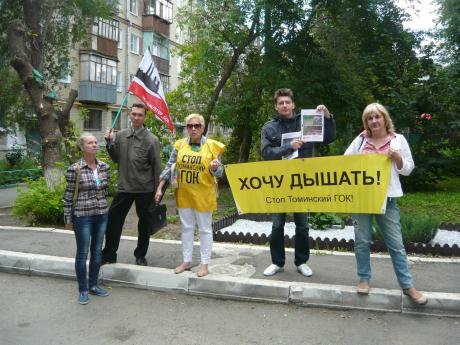 The authorities’ attitude to Chelyabinsk residents is already provoking open resistance. Rallies against the Tomino complex have been held every few months in recent years, and the Stop GOK movement has the clearest and most active position on the issue. According to its leader Vasily Moskovets, RMK’s project is unconstitutional, and the local authorities are, in effect, repeating the unlawful activities of the project’s backers. 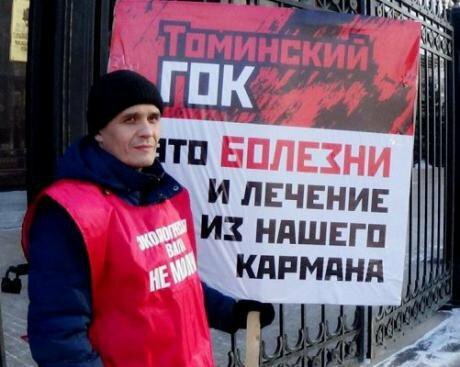 Gamil Asatullin at a solitary picket against the copper plant, Chelyabinsk. Image: Activatica.Local officials regularly refuse to permit Stop GOK from holding rallies or try to permit them in unpopular locations. In particular, the authorities have used various pretexts to refuse rallies during spring and summer this year. For instance, for an unsanctioned rally this past Sunday, the authorities deployed a significant number of police and equipment, in order to deter and intimidate participants. This resulted in a small number of participants, several of whom were detained both during and after the protest in relation to a criminal investigation. Gamil Asatullin, a Stop GOK participant and local political activist, was recently arrested on charges that he attempted to burn down the mining complex site. Asatullin was arrested by a group of FSB and anti-extremism officers, and the investigation is likely to involve several more activists of the Stop GOK movement. Attacks on Chelyabinsk’s ecological activists can also be found in the local and federal press. In June this year, local TV Channel 31 broadcast a documentary film which called Stop GOK a “political sect” that was trying to bring down the region’s economy. “They present themselves as ecologists and researchers. But as a rule, they aren’t. These activists are involved in ecological extremism and are controlled and financed by foreign organisations,” the voice-over claimed. The region’s main print and online media have a similar opinion. This is why people involved in the movement consider social media groups to be the only source of information on the potential risks of the Tomino plant. "The imposters", a recent film broadcast on regional television, "exposes" Chelyabinsk activists for pursuing foreign interests. Despite the difficulties of getting the message out, public actions against the development of the Tomino site regularly gather hundreds of people. These people aren’t only concerned with the ecological risks, but the outflow of capital and people from the south Urals. According to Oleg Vitkovsky, president of the Ural Economic Union, over the past few years, 150,000 people have left the region — and the main factor for emigration has been the environmental situation. In turn, the people who move to Chelyabinsk for work are mostly from neighbouring regions or former Soviet republics, and travel mostly for low-skilled labour. In any case, it seems likely that the Tomino complex will not find itself with a labour shortage — over the next three years, it plans to hire 1,200 people. Most people are willing to forego principles, including dissatisfaction with the environmental state of the region, to find work in an increasingly difficult market. Chelyabink’s ecological problems are no secret. The city suffers from poor weather conditions several months a year. You can feel the industrial smog all year round. At this time of year, the city is covered in mist, visibility is reduced, and the air reeks of chemicals. The south Urals has already found itself at the bottom of Green Patrol’s ecological rating three years running. People passing through notice the air immediately. Russia’s Minister of Ecology Sergey Donskoy stated in 2016 that Chelyabinsk leads Russia in terms of hard particles released into the atmosphere, and it is joined by towns nearby, Magnitogorsk and Karabash. Last year, Vladimir Soloviev, a prominent TV presenter, called Chelyabinsk an “ecological catastrophe zone”. Perhaps amendments to Russia’s ecological legislation will change this; they’re due to take effect in January 2018. This legislation will ban the construction of potentially harmful enterprises (such as Tomino) without an initial state ecological survey. Meanwhile, RMK has already started construction, and is ready to reach its performance indicators in terms of extraction and refinement in the coming years — though it still hasn’t stated whether it will consider the results of critical ecological surveys. Currently, Russian legislation gives these surveys only the status of non-binding recommendations.